Covered call writing exit strategies include scenarios when share price moves up or down. Our main enemy is share depreciation where we need to mitigate losses but we must also have the ability to enhance returns when share price rises under certain specific conditions. This article will evaluate a trade sent to us by Mario G on a stock (THO) that moved from $100.00 to $108.64 per share mid-contract. With two weeks remaining until contract expiration, we must evaluate the opportunity to use the mid-contract unwind exit strategy to generate a second income stream in the same month with the same cash. Mario astutely noted that THO had a projected earnings report date of 3/6/2017 and therefore would not be including this security in his portfolio for the March contracts. Since an at-the-money strikes was initially sold, there is no opportunity to generate additional profit from share appreciation. Mario has maximized his 3%, 1-month return and THO can drop in price by 8% and that 3% will still be realized…a nice position to be in. However, as Blue Collar Investors, we dig deeper. What will be our actual time value cost-to-close and can we generate a greater return than that cost-to-close in a completely new position in the two weeks remaining in the contract? 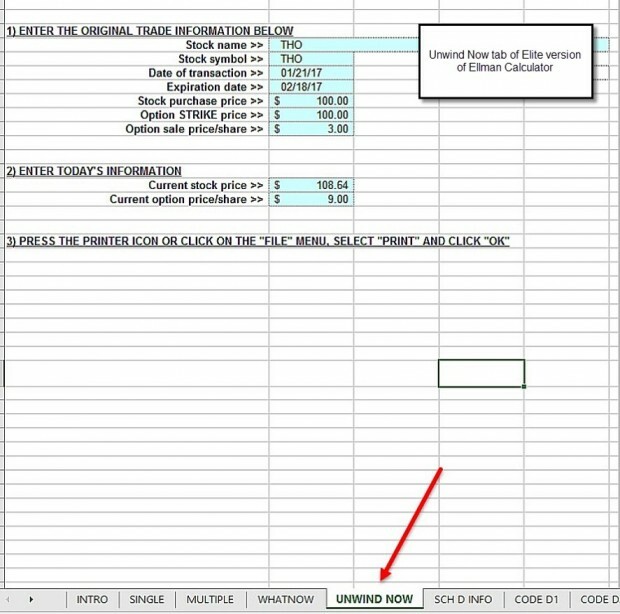 For premium members who have access to the Elite version of the Ellman Calculator (also available in the Blue Collar store for non-members), the “Unwind Now” tab can be used for this calculation. If the cost-to-close is such that we can generate a return of at least 1% greater than to actual cost to close, it is worth closing. Some investors may set a higher or lower parameter but that is mine. For example, if the cost to close is 0.5% and we can generate a 1.5% initial profit in a new position, it is worth considering. In this case, the strike is $8.64 in-the-money. 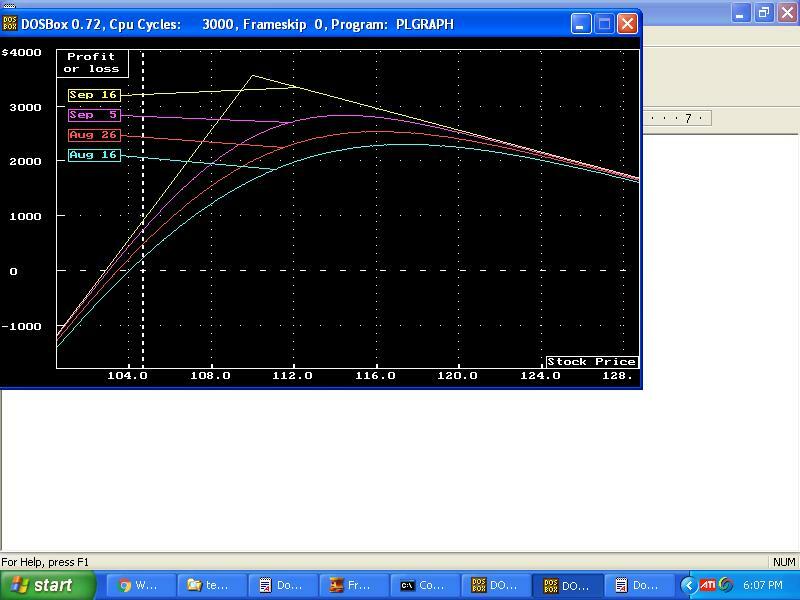 This means, the cost-to-close will be $8.64 + a time value component. If the bid-ask spread is $6.30 – $9.00, the cost-to-close will be between $8.64 and $9.00. Let’s use worst case scenario and say $9.00. 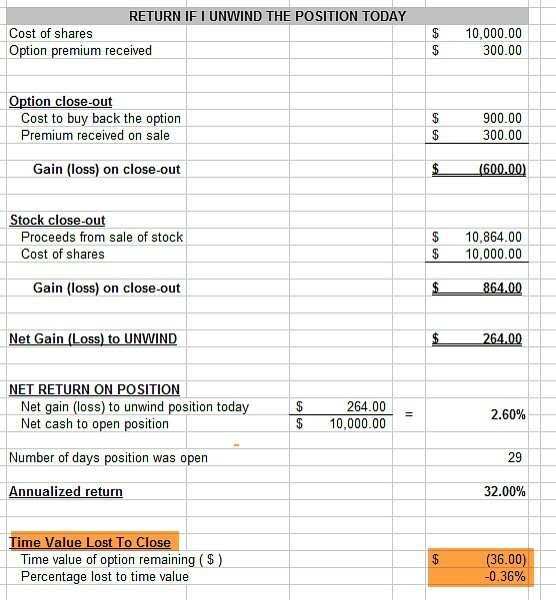 This demonstrates that the time value cost-to-close is $0.36 0r 0.36% My threshold would be 1.36% or higher for initial time value return on a new position or I would allow assignment and congratulate myself on an outstanding trade. When strikes move deep in-the-money, our maximum returns are close to ensured if no action is taken. Consideration should be given to closing the position in its entirety mid-contract (mid-contract unwind exit strategy) if the time value cost-to-close is near zero and a new position will generate a return at least 1% higher than that cost-to-close. Thanks to Mario for inspiring this article. (Hard cover versions also available only on this website). BCI: I am currently favoring out-of-the-money strikes 3-to-2. The 6-month charts point to a mildly bullish outlook. In the past six months, the S&P 500 was up 8% while the VIX (10.03) moved down by 12%. I’m from Chattanooga TN. I read your books several years ago, but I didn’t sell covered calls at that time. I just watched your Beginners series of videos. I learned several things that I can use in selling covered calls. I actually started selling covered calls in 8 accounts (2 of mine and 6 family members accounts). Since April 5, 2016 I’ve made 622 option trades. I was finding options with the highest premiums available. I made a lot of money on selling the calls but I was losing a lot of money on the stocks. After watching your videos, I dumped the ‘Dead Money’ stocks and re-invested the money in the best up trending lower risk stocks that I can find. I’m averaging 2.772% per trade per month or 33.269% return per year. I think I can make from 2% to 4% per trade going forward. My question is since Microsoft has discontinued Stock Scouter, are you using something else to obtain stock ratings? The developers of the Scouter (risk/reward) algorithm tell us that they are negotiating with vendors to make these stats public once again. In the interim, they have been sending my team the updated stats and we are providing them in our member stock reports. For those who are not premium members, using all other BCI fundamental, technical and common sense screens will still result in an outstanding, quality watch list . My team is also working on an alternative risk/reward screen should the Scouter becomes permanently not available (unlikely). Congratulations on your recent success! Maybe I am not understanding this, but if you got 3% for the option, but your stock price drops 8%, overall you will have lost money due to the stock price decline? The 8% reference I made in the article relates to current market value which is $8.64 above the price paid for the stock. So even if the stock drops in price by 8%, the 3% time value premium will still be realized. I agree 100% with your article. My recent preference is to close this kind of position in it’s entirety, even if there is no new position available to generate additional return. The reasoning is that the risk/reward for waiting 12 more days to make the remaining 0.36% is not worth it. But, obviously, once the cash is there, I will be looking closely at the Weekly Stock Screen to find a new CC trade. Mario’s kind share of his trade on THO and Alan’s discussion reminded me why I adopted one of my little trading rules on high performing stocks – don’t cover them all at once :)! I complain rarely when stocks go up. Rising markets are usually near the bottom of most people’s worry list :). But I have had my share of THO stories and they can be frustrating when in a covered call in a rising stock and/or rising market. Alan mentioned Mario had multiple contracts. So I’ll just pick a number out of thin air. Let’s say Mario had 400 shares of THO. He made 2.6% in less than a month as outlined above. Nice work indeed! Had he split it and only sold 2 contracts and let the other 200 shares run he would have made twice that return assuming same sales date. Had THO gone down, however, he would have been in better shape than regular shareholders. So it’s always a market view frame of reference. Neither hindsight or the market can ever be wrong. Only we can be that :)! My point is not to diminish for one second how well Mario managed this trade which was excellent as he always does! In fact he wrote his covered call ATM telling me he was neutral on THO. No one can see the future but he made money on a neutral trade which was great! My intent is to suggest the flexibility of these strategies is limited only by our imagination. It is not just which stock to pick, which strike to choose and how to manage it. It’s also about when not to pick and conversely when not to cover, what your market view is and what degree of conviction you have in it? Mario came out of that trade well, but would you have placed it yourself? I note that THO was at 75 only a few weeks earlier, making it 33% higher at the time of the trade, and thus generally more vulnerable to a sharp retracement. Everyone has their own methods as you’ve said, but personally I look for stocks making more gradual uptrends. This trade actually highlights the importance of another BCI rule (not guideline) and that is to avoid earnings reports. The chart below shows that the stock price did move in a pattern we all prefer, and I agree, a gradual uptrend, after Mario’s trade. The price moved up to $115.00 (green arrow). Then, on March 6th, an earnings release (red arrow) and the bottom fell out. We would NOT have been in that [position on March 6th and probably for months thereafter. The next earnings release resulted in a significant movement in the other direction. Now, you make a good point regarding the volatility of the underlying. We can measure that by the 1-month return of near-the-money strikes. In this case, it was 3%. For me, this is perfectly reasonable. For others it may be a bit high or a bit low. I would not use this stock in my mother’s account where I target 1-2% but I would not walk away from a 1-month return of 3% in my accounts. One size does not fit all. I love a good rocket stock. My reasoning is this: you’re providing liquidity to other traders. On a stock that is moving there will be plenty of buying interest in the calls. The supply/demand is going to drive up the cost of the calls (despite Greeks and all pricing models, supply and demand still rule) which hopefully creates an additional edge. If you just bought the stock, then you have let’s call it a 50/50 chance of profit or loss (the odds are never even but let’s call this a fair estimate). If the stock goes above your purchase cost, you gain. If the stock goes below your purchase cost, you lose. With the use of an option, you have expanded your profitability from a point of singularity to a range. Selling short the call option has created one guaranteed return and a reduction in cost basis or risk reduction on the other position. You want an underlying that is going to pay you something. If you look at a boring blue chip stock (which is what some CC writers would advocate) you get maybe $18 or $20 for a month less commissions might leave you with a very bad reward/risk of maybe $10 or $12 potential gain (assuming no closing commission which would cut that down to maybe $2 or $4). That’s hardly worth the effort, if you ask me. You’re going to make your broker rich and the reward/risk is so skewed due to the high impact of commissions (50% or more lost in transaction costs) that you’re in a default “losing” position–far too much risk for the reward. If you look at high flying stocks, they tend to go up–rest or pull back just a bit–and then shoot higher (in normal bull market conditions). The biggest momentum stock index that you probably look at every day is called the S&P 500. It likes to find stocks that are moving up in price and buy even more while it will go ahead and sell off stocks that go down in price. When you start to think about it, you may quickly understand why most people underperform this “dumb index” and that’s largely because everything they’ve been trained to do perpetuates their losses. “Buy low, sell high” right? Not really. Buy high and sell higher. Sell low and buy back lower. People like to pick up the idea of some stock that just went to the moon, e.g. “I wish I bought MSFT back in the ’80s” or “I wish I bought AMZN at $50”. Then they miss buying MSFT in the ’90s or AMZN at $150 and watch it go to 10X what they could have purchased it for. Don’t trade with a fear of missing out but when a trend is in, just ride it. Always assuming that the trend is just about to reverse is a sure way to never capture profits. You’ll run away at every little dip. Establish hard and fast entry and exit rules. The BCI system does a lot of the guidance for you. You just need to setup the trade that you’re comfortable with but don’t run screaming for the hills on a $2 or $3 pullback on a $100 stock. Find your trend lines and know when the trend is showing signs of breaking. Momentary weakness happens in all stocks–nothing goes straight up. If you write a CC on a stock that just exploded, you’re probably fine as the next likely moves are going to be sideways or a slight pullback. If it keeps going, decide what the next move is in advance–do you roll up and take on a bit more risk? Do you cash out and find another target? What news is coming out? About 70% of stock plummets are around earnings. The BCI already eliminates that 70% which leaves you with only about 30% of drastically bad events left to possibly ruin a trade. With 5 or 10 trades on, if you can go ahead and exit that one that comes along here and again you should be in a position to win with frequency and with $$ volume behind you. As I’ve become more comfortable with the rocket stocks, I will at times on a harsh one-day decline go ahead and sell a NTM or OTM put on the position (doubling my exposure) and taking advantage to the IV expansion that happens on a drawdown. A nice bounce usually gets me a nice little kicker on the returns for the month in just a few days. Keep in mind the market environment we’re in, though. You couldn’t do the same in poor market conditions. As a recent example, I was long FIZZ with an OTM strike written against it. The stock suddenly plunged along with the broader growth/momentum stock sell-off that happened (maybe it was June?). The IV expansion caused the premiums to increase quite a bit. I felt confident that this was a temporary move, so I sold a cash secured put ATM and brought in another several hundred in premium. The stock rebounded and I closed the put thus reducing my exposure to the security again and more than doubling my initial returns. If I was less confident, I might have just done a more limited risk play and sold a bull put spread (sell an ATM put and buy a further OTM put to protect myself–maybe expose myself to $500 less the premium received on a 5-point spread, call it bring in $230 while risking $270 or something of the sort). Anyway, I hope some of that rambling might help. We all need to work within our risk tolerances but the more we arm ourselves with whatever we need to make trading less emotional and a lot more mechanical–the better. Sometimes it’s knowledge, sometimes it’s hard and fast rules, sometimes it’s all of those things and more. Yours is never a ramble. It helps a lot. Thank you for taking the time to write it. I used your cash secured put idea on QQQ when it dipped in June and made a very nice return on that frozen cash in a short period of time when it bounced. Had it not bounced I was comfortable buying it at the OTM strike I chose at a “discount” from where I sold the put. That all sounds very interesting. Do you employ Jay’s strategy of selling the option at a later date or do you sell them when you buy the stock? And what sort of overall returns do you find you get from your strategy, since I gather you’ve been doing this for a long time? This week’s Weekly Stock Screen And Watch List has been uploaded to The Blue Collar Investor Premium Member site and is available for download in the “Reports” section. Look for the report dated 08/04/17. Premium Members note, a new Blue Hour webinar has been uploaded to the Premium Member website.. Per Alan’s response…We avoid US airlines because they report monthly capacity reports which can impact stock price much like earnings reports. RYAAY which does not operate in the US does not provide such reports, to our knowledge. Capacity comments seems to be mentioned during earnings releases on a quarterly basis. If we find that RYAAY starts providing these monthly reports, it will be added to our banned list. RYAAY also provides a wide range of non-airline travel services in Ireland. I recently watched the portfolio overwriting webinar from the member site and plan to use this strategy in my mother’s account with stocks she’s owned forever (it seems). Can I use the same Ellman calculator for this strategy? Yes you can but we will be releasing 3 additional calculators later this year, one geared specifically to Portfolio Overwriting. It will reflect returns based on annualized goals and will show 1-week, 1-month and 2-month returns. These calculators will be available in conjunction with the release of our next book, “Covered Call Writing Alternative Strategies” which I am co-authoring with Barry. Since Jay has mentioned overwriting and THO is a current topic, here’s a time slice graph of what selling 6 Sep $110 calls for $1.50 against 500 shares purchased for $104.68 (Friday’s close). My Photoshop skills are non existent so I have no clue how to provide this other than a screen shot. I guess we shall see… or not (g). Probably not since it’s an RTf file. Save your image in JPEG format and the enter using the “browse” feature in the blog. Thank you very much for your thoughtful responses. They are extremely helpful. I plan to use the techniques Alan discussed in the webinar to minimize the risk of her shares getting called away but we understand that it is still possible. We feel the extra income mom will receive is worth the risk of possible early assignment. The late great Robin Williams once joked the definition of redundant is redundant! So I apologize if this post qualifies :). You are right about the brutality of the tax code but I have a different perspective. When I have years where I have to send a big check to the gubbermint for my cap gains, I’m happy as a clam (not sure why clams are happy cuz they tend to get steamed). More for the Feds means more for me. If the stocks have large cap gains then you need to give serious consideration as to whether covered calls is the best idea. IMHO, if the stock powers up, it’s not a good idea to buy back deep in-the-money short calls at a loss to defend paper gains in the stock, in order to avoid the tax bite. The market often has a perverse way of making you pay for that. I may be the one swimming upstream against the current but if the stocks do not have large cap gains then the objective of the covered call is to be assigned and the sooner, the better because you are then making the maximum amount from the position and you can move on to another hopefully profitable position. ALWAYS write AT LEAST 30-days+ out (and always OTM which Alan describes in his strategy). The tax man may cometh with UNQUALIFIED Covered Calls. Some of the tax code is rather convoluted due to the genius of some who are magicians at tax avoidance. Unfortunately, their genius results in sometimes difficult to navigate rules intended to catch them but may, in reality, just punish average Joe investors. There’s a pretty good free online qualified covered call calculator that you can use. I don’t warrant that any of it is accurate and this isn’t my site. But this may be worth looking at before writing a call to make sure you don’t inadvertently trip an ugly rule. The violation affects those with long-term capital gains status. If the covered call is unqualified, the treatment of stock profits changes. QCC has no relevance if the stock has short term capital gain status. Dr Ellman, have you ever had a contract cycle where all/most of your stocks declined in value? How do you handle that from an emotional perspective? I am a new investor and from my reading it appears that the risk in CC is the underlying stock. You are 100% correct, the risk is in the stock, not in selling the option. When we sell an option, we are lowering our cost basis and thereby increasing our opportunities for successful investments. It would be extremely rare for most of my positions to go down in value in a contract month but it probably did occur in 2008. We must avoid emotional responses to this or similar less serious scenarios by establishing a trading methodology that we have confidence in and one that we have mastered and practiced (paper-traded). This will eliminate emotional responses and make us successful investors. Your concerns are typical for new investors and I still remember having similar thoughts back in the day. Take your time to master all aspects of this or any strategy you choose. Your confidence will rise as will your skill level. In years like 2000 and 2008 when the market, lost over 50+ of its value, you’d be hard pressed to find many optionable stocks that rose in price. There were some but they were more the exception rather than the rule. You’ll have a lot of difficult decisions if we see that kind of carnage again. I didn’t forget anything (g). Know your audience? In 2008-2009 I was net short for the entire time. But I doubt that’s the make up of many here. Most people who are writing covered calls have little to no experience with shorting, buying puts, buying inverse ETFs or anything else that is geared to profiting from from the downside. As for gold, it is unreliable in sharp market corrections. It often correlates with the market the downside. For anyone interested, Macrotrends.net offers decades of historical graphs of gold, indexes, etc. Inverse ETFs are included in the BCI ETF weekly report (always with the disclaimer that they will lose in “normal market conditions”). In fairness, I don’t fit in the camp that doesn’t have experience shorting, etc. I do find short candidates and actively short as a part of portfolio management. And, yes, when everything seems to be collapsing in a panic–everything collapses in a panic and correlations become very high indeed. So far I have always left at least 25% of my capital (for investing) in cash. In the event of a significant market correction I would have plenty of dry powder to re-enter the market. Of course, I realize that I am earning nothing on the 25%, but to me it’s an insurance policy that let’s me sleep better. How did your GLD position work out? I recall that it was kind of close going into expiration. Were you able to hang onto the shares and write another month? Thank you for your great memory and kind follow up. I have been fighting computer problems this week and been out of the loop. My GLD trade has been a good one. I was assigned 500 shares as a result of a cash secured put some months back and immediately started a call writing campaign. I don’t suppose many people think of GLD as an income stock but it has been for me :).It expired OTM in July and I kept the shares. I skipped the calls this month since I felt a tremor in the force and thought stocks might go down and gold might go up but I should have at least sold 2 contracts. Why is the man in the mirror a hard guy to listen to :)? It is because I always second guess myself. Human nature I suppose…. It’s easier said than done but no matter what we do in the market, most of the time there was either a better way or a better time to have done it. Woulda, coulda, shoulda. It’s non productive. You take your best shot, hope for the best and manage it when it’s the worst. Then move on. Good stuff by MJ but since I don’t know any songs that celebrate covered calls, I’m still smitten by the music of my ‘yute’ from the British invasion through the Vietnam era classics up until disco came in. Woodstock has to be the greatest collection of assembled artists before the modern era of disaster charity benefits. Short selling is a topic that I haven’t addressed in detail on this site mainly because it should be reserved for sophisticated, experienced investors like Geoff. Before considering this strategy we must learn to manage risks like dealing the market’s upward bias, learning how to set stop-losses to avoid unlimited loss potential, the possibility of margin call, short squeezes (shorters covering in mass) and the possibility of having to pay dividends to lenders. There is also the factor of the lending fee. That said, shorting can be a useful tool in extreme bear market environments but should be reserved for the most sophisticated investors and, in my humble opinion, is not appropriate for most retail investors. If we had another 2008 (many more safeguards in place to avoid this) , I would lean on inverse ETFs which are published weekly in our Premium Member ETF Reports. I notice there are the same 4 inverse etfs in our reports each week. Can you explain. The reason we publish the same 4 inverse ETFs is that we will rarely have use for them but when we do, we want to be properly diversified and make sure there is adequate option liquidity. We use inverse ETFs that are short the Dow 30, the S&P 500, the Russell 2000 and the Nasdaq 100. You are absolutely correct that short selling is for experienced investors and traders. While you are correct in your general comments, they miss the mark in several ways. Dividends occur quarterly so they are easy to avoid. And if one decides to hold short through ex-div, since the exchanges reduce share price by the amount of the dividend, it’s not a loss to the shorter. And they can be offset in other ways but let’s KISSpin. For the most part, borrow costs on large caps like the S&P 500 tend to be very low. Paying 1/4 to 1/2 pct a year when a stock is cratering 50% is a drop in the bucket. In 2008 and 2009, I was shorting size in illiquid issues with much higher borrow costs because they move a lot faster than a high float issue like IBM. Each year I paid out over $7,000 in borrow fees – just the cost of doing business and another drop in the bucket. Margin calls are only factor for those who leverage heavily and for those who practice zero risk management. If disciplined, being short is no different than being long.. Only the direction is different. Short squeezes do not occur in S&P 500 stocks. No one is moving IBM or AAPL or the like that way. Inverse ETFs are no safer than shorting, if wrong. Being short by being long has the same risk as being outright short. If you are short SPY and it rises 10%, the inverse ETF also loses 10% on the rise (give or take). While you may avoid the borrow fee, etc,. the inverse has other inherent cost issues against you. Being on the right side of direction is all that matters. To repeat, you are absolutely correct that short selling is for experienced investors and traders. If we have a repeat of 2000 or 2008, being long for 18 months as the market drops 50+ pct is not going to work out well. It didn’t then and it won’t next time either. For those uncomfortable with the idea of shorting, at least try to formulate a plan for limiting your risk in such a debacle. Ignoring dividend reinvestment, a 50% loss takes a 100% gain to break even. Cut that loss to 10-20 pct and you go into the black much, much sooner. On the watchlist for premium members, what is the source for the stocks marked ‘other’? 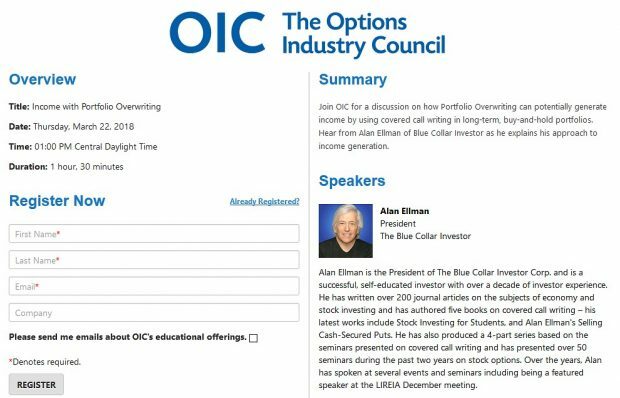 The stocks listed as “other” are securities that are part of our own BCI database. They are stocks that have been identified in the past as potential option-selling candidates. The are are 3000 stocks screened for our members each week in addition to the IBD 50 and IBD Big Cap 20. All stocks that are listed as eligible in our premium reports have passed the rigorous BCI screens from all resources. This is turning into the most profitable CC cycle for me so far. I have been following the BCI exit strategies to a tee. I have only had one stock move against me (AMAT) and most likely the 46.50 Aug 11 call will expire worthless. I am debating whether to hold AMAT through it’s ER or just book the $2 per share loss. Picked up the FIZZ Aug18 110c today. Some very nice premium for 10 days. I am very new to investing ,have been going through your videos,and they are really very good. I just have a question about the premium calculation when writing covered calls.Is it the bid price in the option chain? Where can I find the time value in option chain. Yes, we sell at the “bid” price and buy at the “ask” price. For at-the-money strikes (same price as the stock price) and out-of-the-money strikes (above current market value) the premium is 100% time value. Only in-the-money strikes (lower than current market value) have intrinsic value components. You can download our free Basic Ellman Calculator from the “Free Resources” link on the top black bar of our website and all these calculations will be done for you. One of my many faults is I give people unsolicited advice :). Buy/Write is a bet with a small edge. Buy/Write sets a limit on projected yield, but gives you some protection. Buy/Wait may reward you handsomely. Nobody can tell. Pick your choice, stay consistent, and sleep well. In and of itself, B/W does not give you an edge. It’s has a poor risk/reward ratio (limited reward with large potential loss). You will markedly under perform in bull markets as you collect small premiums compared to the upside growth you give away. Although you will outperform in bear markets (by the amount of the premium), that is exactly when you don’t want to be B/W-ing (long) since you can lose significant amounts in a full bore bear. In addition, taxes (for non sheltered accounts) and more frequent commissions and slippage will add performance drag. What makes B/W succeed is quality selection, good timing and disciplined risk management. That’s the edge. If you don’t manage your losses, collapses like GWW, TGT, and CAH this year can take away the gains from 5-10 or more successful writes. I understand, and will revise my mental stance regarding Buy/Wait trades. My risk tollerance is very limited, and is obviously making me miss some great opportunities. Here’s an example from this week. Dillards (DDS) was a $78 stock two weeks ago. Two days ago, it was over $73. Today it’s under $59 after a bad earnings report. Someone who sold an OTM covered call has lost $15 to $20 in less than two weeks in return for a few dollars of call premium . In a binary choice world of who does better, the outright share owner or the covered call writer, clearly the covered call writer is better off by the amount of the premium. But that’s a bit of a Pyrrhic Victory, eh? Granted, this was a bad earnings report but this is what happens to a much larger degree in a bear market. I know that the CC is a very small protection, and I do stay clear of earnings reports (Alan’s rule #1). Of course there are other unexpected events always happening, but these are difficult to avoid, and I am watching all my trades several times each day, and implementing the exit strategies by the book (Alan’s book). On the other hand, a little more risk with some Buy/Waits can make a nice extra income, as Jay correctly suggests, and, as you say above, is apropriate in a bull market. Thanks for helping me with your very wellcome explanations.